DOST-PAGASA said that the center of the tropical storm Helen is located at East Southeast of Tuguegarao City, Cagayan. 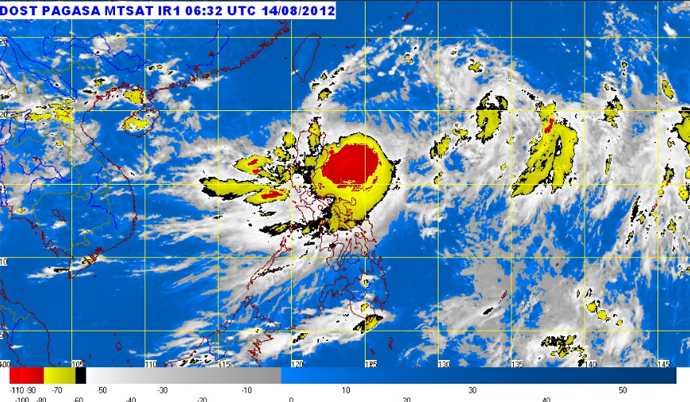 With a maximum sustained winds of 75 kph near the center and gustiness of up to 90 kph, as posted to its site. PAGASA said, "Tropical Storm "HELEN" has maintained its strength as it continues to move towards Northern Luzon." Meanwhile, residents in flood/landslides risk areas are advised to take precautionary measures and monitor the situation in their surroundings, PAGASA said. Comments or suggestions about " Tropical Storm Helen Update August 14, 2012" is important to us, you may share it by using the comment box below.